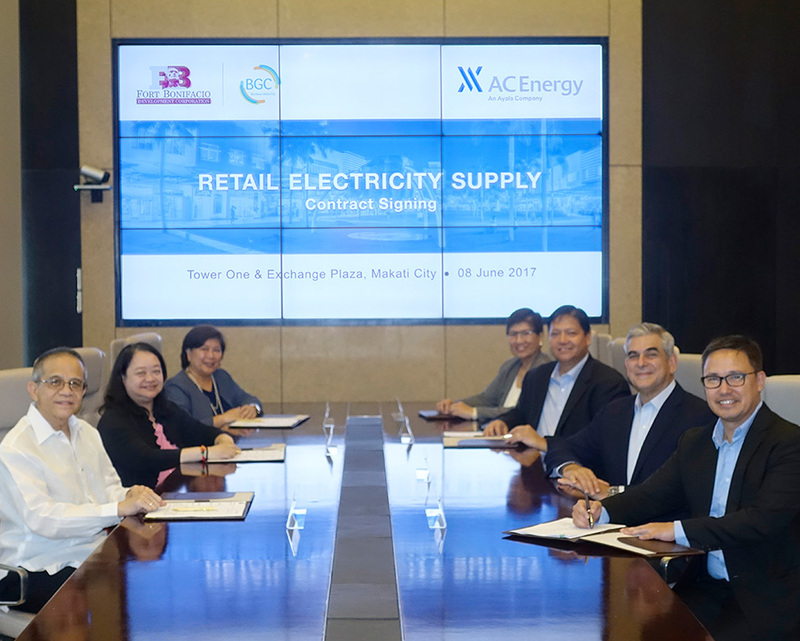 Fort Bonifacio Development Corporation (FBDC), master developer of Bonifacio Global City (BGC), entered into a retail electricity supply agreement for eight (8) of its buildings in BGC with AC Energy. The electricity supply will include Certified Emission Reductions (CER) certificates sourced from renewable energy plants, ensuring that the electricity purchased by FBDC is carbon neutral. “This partnership with AC Energy is part of our commitment to maintain a progressive yet environmentally sustainable community. This is just the first eight buildings. We intend to do the same for our future developments and hope to encourage other BGC locators to follow suit,” said BGC’s Head of Commercial Operations Manny Blas. Present during the contract signing between FBDC and AC Energy were Ayala Corporation Chairman and Chief Executive Officer Jaime Augusto Zobel de Ayala, BGC Head of Commercial Operations Manny Blas, FBDC Chief Financial Officer Ma. Lourdes Reyes, Bases Conversion and Development Authority (BCDA) Executive Vice President Aileen Zosa, AC Energy President and CEO Eric Francia, AC Energy Chief Financial Officer Corazon Dizon and AC Energy Head of Retail Electricity Supply Miguel de Jesus. AC Energy is expected to supply power to eight FBDC properties in BGC, such as the BGC Corporate Center, Bonifacio High Street, Central Square, Bonifacio Stopover, Park Triangle, and the Bonifacio Technology Center.